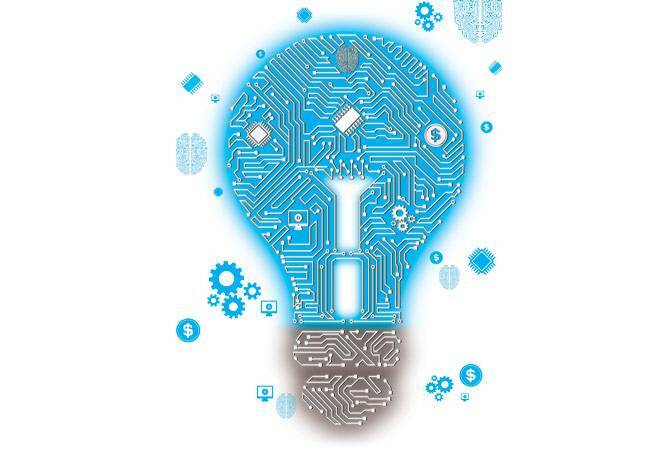 The Indian information technology services industry is investing in innovation, reskilling and automation to adapt to a changing marketplace. Indian software companies may not be reporting the 25 to 30 per cent growth rates they had witnessed a few years ago - and probably will never again - but they are still making rapid strides on the back of innovation, improved revenue productivity and by investing heavily in technology such as automation and the Internet of Things (IoT). Lobby group National Association of Software and Services Companies (Nasscom) estimates that the Indian IT industry is worth $146 billion, including exports of $98 billion, in 2014/15 - clocking year-on-year growth of 13 per cent. In 2015/16 it is expected to grow between 12 and 14 per cent. According to B.V.R. Mohan Reddy, founder and Executive Chairman, Cyient, an IT services provider for the engineering and aerospace industries, though the current growth rate looks a little bit tepid compared to what it was five years ago, it is coming on a significantly larger base and amid challenging market conditions. Nasscom says the industry would touch $225 billion by 2020 and $350 billion by 2025. Reddy, who is also the Chairman of Nasscom, says IT companies are fast adapting to the changing market needs and tapping newer segments to stay ahead of the curve. The pack is being led by Tata Consultancy Services, Infosys, Wipro, Cognizant, HCL and Tech Mahindra. The move of global IT majors towards automation, cloud, digital and software as a service (SaaS), was seen as a threat to the Indian IT services industry. However, the Indian companies were quick to react and have invested substantially on innovation, building intellectual property, platforms, and using artificial intelligence (AI) and automation to deliver value. And now they are evolving more as solutions providers to ensure business outcomes, moving out of the shadows of the lift-and-shift model - taking and executing orders at lower cost. For instance, India's largest IT services exporter TCS unveiled its AI platform 'Ignio' in June 2015 as a standalone product, as well as a bundled offering with its other services. The second largest player Infosys unveiled 'Aikido', its umbrella offering in August. It would encompass design thinking, platforms and knowledge-based IT services. Similar initiatives have been undertaken by most companies, big and small, in the Indian IT industry. Indian technology companies have so far been compared to ducks floating on water - while the surface may seem calm they are pedalling furiously to glide smoothly. "Indian companies are now changing tremendously to adapt to challenges happening due to marketplace shifts and changing needs of customers. I am confident that the Indian IT sector has the talent and expertise to continue innovating and delivering value," says Reddy. Sudin Apte, Research Director and CEO of IT services advisory firm Offshore Insights, however, is not quite sure. 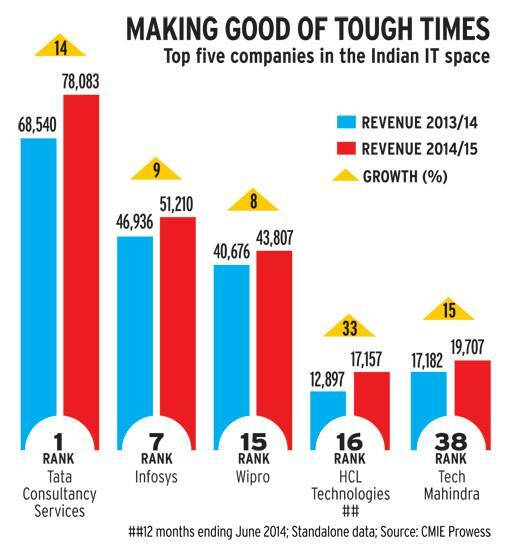 "The Indian IT sector might grow in high single digits for the next three to five years. While the smart ones are investing and moving ahead of the curve, there is considerable pain for others. In Nasscom's top 50 Indian companies there are several who have no reason to exist. We will not see too many mergers and acquisitions as promoters will cling on for various reasons. Several of them are me-too companies," says Apte, adding that Indian IT's cost advantage has eroded and five of the top 10 IT employers in India today are multinationals including IBM, Accenture and Capgemini. Apte further argues that delinking headcount growth from revenue growth was forced on Indian firms by clients demanding automation in areas such as application maintenance, testing and infrastructure management. "TCS might have employed 300,000 people to get to $13 billion in size. The next 50 per cent growth on their current base, that is, to reach $20 billion in revenues, they may add just one-third of that number of people." Reddy agrees: "If it took 3.1 million employees to generate $100 billion revenues for the industry, Nasscom estimates that the next $100 billion is likely to take only 1.8 million." He, however, adds that fears that Indian IT will not be able to sustain growth are uncalled for. "I have heard it before. We were told that after the Y2K work, it was the end of the road for us. After the dot-com bust in 2001 we were told the same thing. During the global economic meltdown in 2008, similar stuff was said. Indian IT is mature, innovative and delivers true value. This is why we expect it to continue to grow." The results of anticipating marketplace shifts and investing ahead of the curve are seen in the results of the likes of TCS and Cognizant, which have grown faster than their peers. Says Sanchit Vir Gogia, CEO, Greyhound Research, another IT research and advisory firm: "While we might churn out lakhs of engineers every year, most of them are unemployable. Shifts in technology landscape means that even existing employees need to be reskilled in emerging technologies. Not all employees might be able to make the transition. Ability to attract and retain talent is going to be key." He sites efforts by Infosys to train its employees in design thinking. Reddy though sounds upbeat and bullish: "The best days of Indian IT are ahead. As long as the global economy does well, Indian IT will always find ways and means to serve the needs of its customers."